Did you know there are more income streams available to musicians than just touring and selling records? Have you ever thought about how you can become profitable at the career you love? Meet Bree Noble, corporate employee turned profitable musician, founder of Women of Substance Radio, Female Entrepreneur Musician Academy, and co-founder of the Profitable Musician Summit. Bree and I dive into her story and how she created a path for herself after leaving a corporate job, the ins and outs of the Profitable Musician Summit, and her podcasts and business that help female musicians get in the right mindset to make waves. We also talk about managing personal wellness, and the different things that Bree does each day to bring mindfulness and self-care into her busy life. The Profitable Musician Summit is online (yes, online!) from April 22 - May 1. Sign up now to learn how you too can become profitable from being a musician in today’s ever evolving music industry. Where can you find Bree and the Profitable Musician Summit? Are you interested in being a guest on the podcast? Do you know someone who might be a great fit for the podcast? Fill out our Podcast Guest Submission form to be considered as a guest on the podcast! Do you hustle all day, every day to make it in the music industry and sacrifice your personal wellness? I was there too, but by making a few small changes to my mindset, my fitness routine, my nutrition, and my schedule I made my wellness a priority all while hustling, and I can help you do it in just 5 days! Sign up now! Getting in touch with your fans doesn’t have to be difficult. 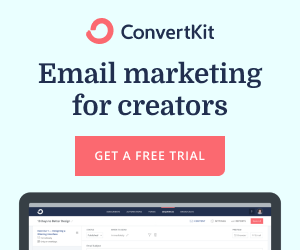 ConvertKit makes it quick, easy, and painless for creators to send out emails. I struggled for months with other email marketing sites that complicated the process of sending quick updates to my audience. ConvertKit simplified my life 100x over with its user friendly interface and easy to use process. Get the automations and marketing tools you need to grow your blog and business. Join me on ConvertKit today!